As a parent I’ve heard that phrase countless times. As a daughter, sibling, friend, and wife I’ve said it just as many times. It’s a true statement. Life isn’t fair. Nothing is. Fair is not getting what others get. Having what others have. Seeing what others see, having the same benefits that others have, nor even experiencing the same hardships that others experience. When my husband and I agreed to hey, why not have some kids, I got pregnant. It took us a few months of sort of trying and yet not really trying to achieve this. Just when I started to wonder why am I not pregnant? – I was. The second time around was even easier. We knew there were others who desperately wanted children, would sell an arm or a leg for the privilege, and indeed spent their life’s savings on fertility treatments. We also knew people who had sacrificed just as much time, heartache, and money to adopt a child to raise as their own. Still others gave up trying. Meanwhile, ours came along as easily as finding a penny in a parking lot. When I stopped working for a salary to support my husband in his career by focusing on managing our home life instead of pursuing my own career, I experienced a period of longing for fairness. It lasted a long time. Is it fair that he gets all the glory while advancing ever upward in his line of work while I fritter away my young adult years at home finding piddly little projects with which to fill my time? Is it fair that he dined out in far-off locales, having adult conversations with other like-minded grownups while I struggled to bed wriggling, nightmare-prone children night after night? Later I asked another question: Is it fair that I get to live most of my life in the home we built while he spends just a fraction of his waking hours living here? Just as we are unique, so are our experiences. We can spend our lives peering over the fence, yearning for better opportunities that are offered to others. We can also be smug and insular, cocooning ourselves from the rest of the world to preserve and hide the inequalities that benefit us and that we enjoy every day. Or we can just live the life that we have been given, share it with others, and accept that life isn’t fair for any of us. We can accept that someone will always be richer, thinner, smarter, younger, healthier, prettier, more blessed, successful, ambitious, fortunate, confident, have a nicer house, better sense of style, keener memory, sharper discernment, cooler dance moves, tell a funnier joke, write a more relatable blog post, call a more interesting city home, and boast a finely cultivated set of talents. And we can acknowledge that there will also be someone whose life we can describe by the exact opposite of these things. When we think about those opposite things, does fair matter anymore? Fair is living our lives without labeling others or comparing. We might not have been given the same chances, but we each have the opportunity to make the best of those chances. Fair is fair, after all. That’s all it ever will be. Oh Andrea. Yes. In every way. Yes. Fair is fair...except when it isn't. 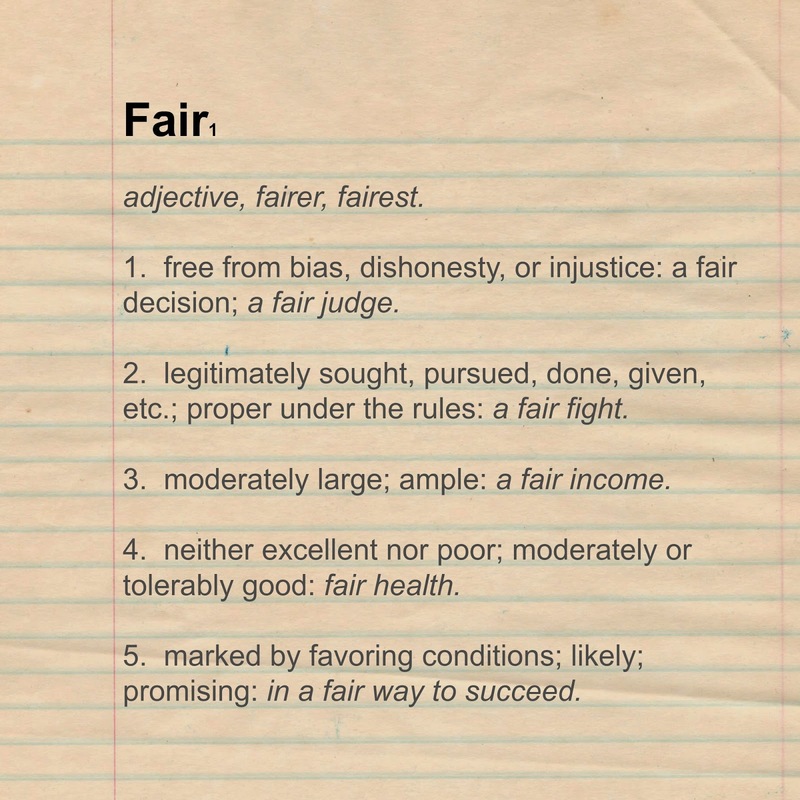 I always thought that saying 'fair's fair' wasn't really saying anything at all. When you think about it, though, it really says a lot. Great post! If you keep thinking that life is unfair you will waste you whole life. Stopping by from Mama Kat's. So true. And thank you! OMG I hate unfair and unjust and a few years ago, I had to adopt the motto "That's none of my concern." I'm not saying I'm great at using it on a consistent basis but it let's my mind and my heart off the hook when I detect injustice or judgement on my part. Great post! I don't like unfair, either, but I'm not a fan of justice for justice's sake. "That's none of my concern" is a good perspective to have. It frees us up immensely, and lets us move forward. 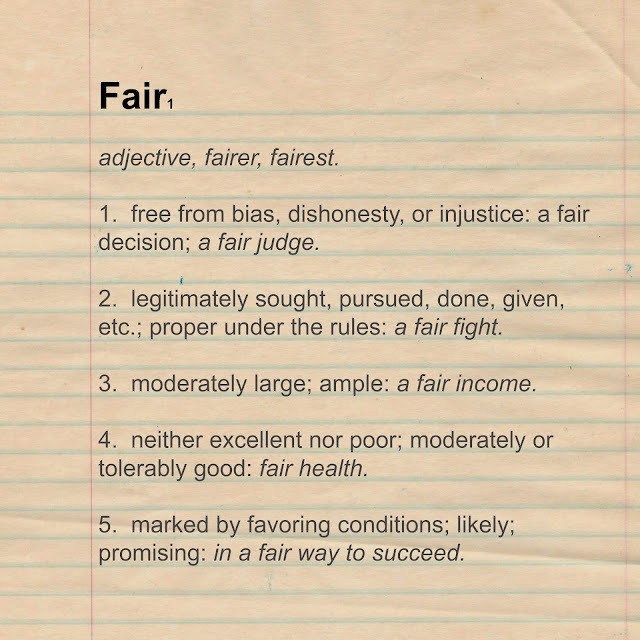 The problem with "fair" is that it comes with a certain degree of entitlement and I despise entitlement. You get what you get and you make the most of it. It can definitely be a hard pill to swallow, but we need to try. Great post! Thank you! I like your style. Once we give up keeping score for fairness, we are spared from so much conflict. Eyes on your own paper, people! I remember when I joined my mothers of multiples club and met so many women who had their twins or triplets because they had undergone fertility treatments, while I got the luck of the draw - spontaneous combustion. It was definitely an eye opener in the world of fairness. I understand this too well. We didn't have problems conceiving either and of course, hit the jackpot with the twins. Life isn't fair, and we're so lucky it's tilting the right way for us on that scale.